Pierre Allain, genial genius. by Stevie Haston. Ask an American who invented bouldering, and they will normally say John Gill if they don't say Sharma. Anyway perhaps Pierre Allain one of the fathers of bouldering at Font deserves a little credit for doing a few things before the star spangled banner. I have one of his carabiners in my hand in the above photo and this biner the first alloy biner, and the PA rock boot were undoubtedly responsible for many of the improvements in the big game of climbing. I have been playing with this biner lately, it's real beautiful, especially compared to older less light biners made of steel, which also used to cut your finger on the gate. Sadly I don't have a pair of PA's, or their decedent and better, the EB which were the initials of Pierre Allains business partner. The EB was the boot which did all the work in the development of our sport, all the improvements from grade 6 to 8, and it was a boot that took a lot of time to improve on! Anyway I asked a good friend of mine who PA was and they didn't know, how sad I thought. Routes like the North Face of the Dru, the Meije face, and a bunch of obscure little sandy boulders in a forest somewhere, thank you Pierre. PA was born in 1904 and so was lucky to be the right age to miss the Great War, he died at 97, playing with puzzles and games. I wished I'd met him, but at least I'ave done some of his routes. The North Face of the Dru was done in 1935, three years before the Eiger and the Walker spur. Anyway there you go, PA. 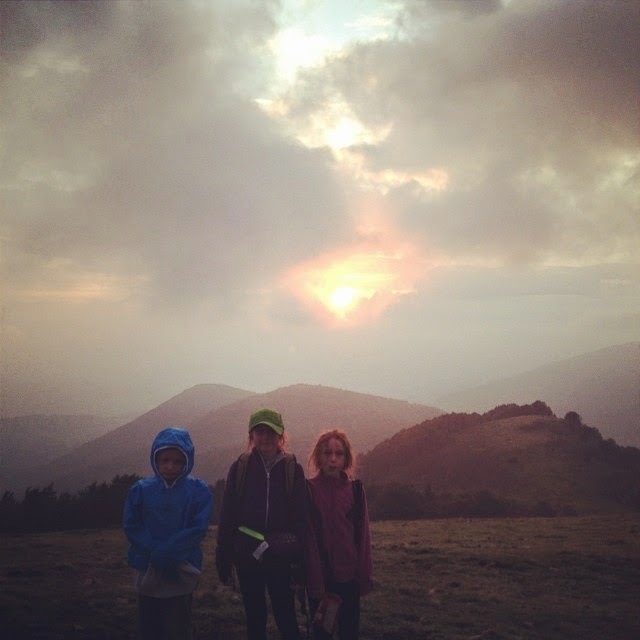 Kids in the mountains. By Stevie 'big kid' Haston. This photo has nothing to do with the mountains but everything to do with the wonderful way kids see, they see so bright and quick, full of surprise, and full of emotion, And I guess the point is that we help them see. My grandfather, a man of very few words and hardly any education, taught me to see, he could really see, and his eye sight was very poor. So we all saw lots of things, clearly little Leo is Seeeing cake mainly. We are doing a faster than guide book time on this mountain walk which I have to say is a very odd thing and must mean that most people in the world today deserve to live in cities and travel underground like worms. This is a bilberry field, I have never picked bilberries so easily and with so much pleasure, the dog caught on quick too and was begging, we were covered in bilberry stains, mouths like vampires or old drunken dames who had crookedly applied a bad shade of lipstick. The kids trying to use sticks. We picked up a few bits of litter from townie tourists but in the last few years even hill walkers and climbers are getting bad. There was a good article in an american magazine about this a while ago, and how the new generation need help and teaching. There were even mentoring classes for people coming out of the gyms and taking their first steps in the hills or on the crags. We shared the mountain with a few hill walkers, thousands of sheep, a few sheep herders who stay up there for months, some mules some donkeys and some horses. The animals didn't leave litter the hill walkers did! There was lots of toilet paper around which attracted the kids attention to piles of human bongo, not nice, not nice at all smeagol. These are the kids in a little shelter on the mountain where we spent the night, the floor was soft sheep droppings, there were mushrooms growing in the corners, edible ones. Leo is 7 and got to the summit first with me, he was proud of himself. We had mist and got down next day before torrential rain and thunder. The kids saw some big drops but were more scared of the big horses and mules. In the bivouac we had two donkeys coming in. 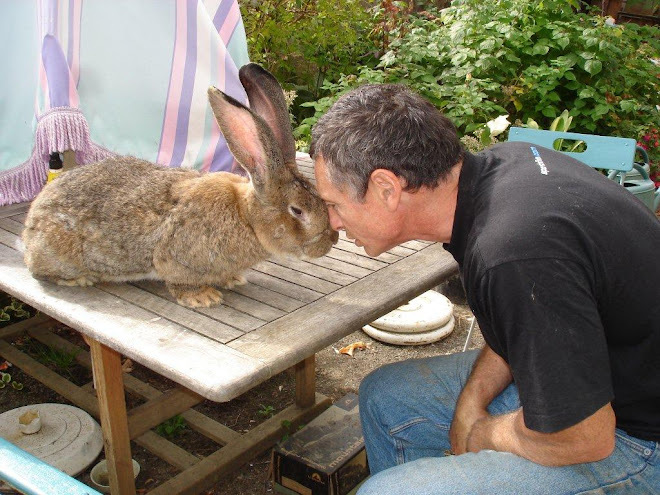 We had a chat with one of our village friends who spends three months up there taking care of sheep, he might be one of the last to do this. He is a man very much like my grandfather, few words, but sees everything. He saw the dog on the lead near the sheep and said a quick thank you and told us how we were the first walkers he had seen with the dog on a lead. He told of the dogs being scared way round the mountain and sheep with broken legs. Anyway seeing is a gift. Scarpa Booster S, by Stevie Haston. My Booster S arrived and I took them for a test drive, really good precise shoes. I tried them on at the summer show, with their famous designer Heinz Mariacher. He very modestly said they were a very good shoe, I'll go a bit further and say they might very well become the most popular high end shoe on the market! Any way I couldn't wait to try them on rock, steep rock, precise footwork type of rock, real French humiliating graded type of rock! I got a bit spanked, the shoes excelled! The sole of the shoe has a few ripples on the heel which helps when your walking around on slabs but the photo is to show the band that pulls the toe down in an arch and gives you foot power on the small holds. The heel is better than on the Scarpa Stix, and won't come off your foot due to the velcro straps. These two straps really crank the fit down, completely eliminating any internal slipping or turning. The internal sole is supposed to be the lightest on the market but I don't think that is as important as it's doing its job so well. The colour is reel cool and you seem to pay your foot work more attention in consequence. It edges inside, outside, and toe very firmly, yet it doesn't feel clunky when you use the pad for big friction dishes. The rubber is Vibram sticky which for me is the best rubber I ave used, its very sticky but doesn't tear through when you push hard on crystals or small edges. The boot is very comfy, the elasticated gusset under the two straps also lets out a bit of sweat. Depending how you size them they could be an all day shoe. I sized mine half a size bigger than my Stix as these are shoes rather than slippers and have a stiffer feel. Take care sizing your boots, I can't stress this enough, there's advise on the Mountain boot site for British buyers, but the fit is really super important. I wore my Stix on a warm up, and then used the Booster S, and noticed a difference on small scoops, and edges straight away. You stand taller in the Booster and the toe doesn't deform to the shape of the hold as much as the Stix, I will carry both pairs around, but on edges the Boosters are best. There's lots of toe rubber which is completly correct, with a few little ribs and roughness to add to its toe hooking ability. 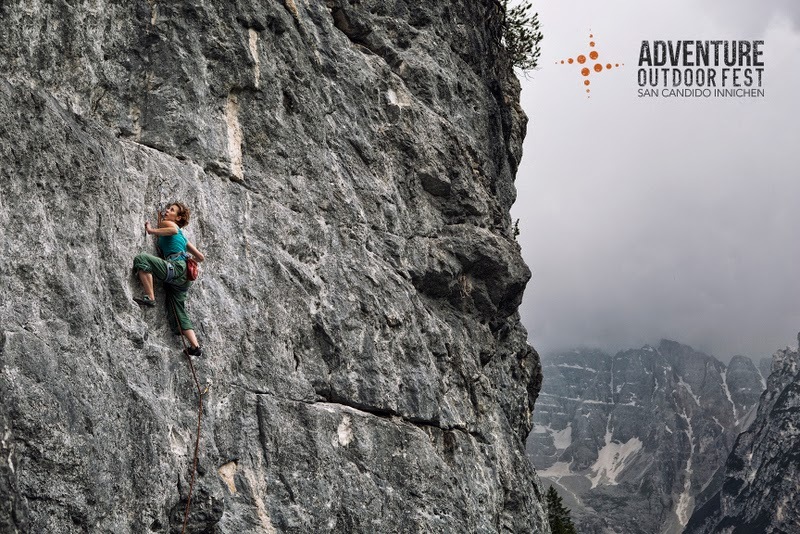 These boots will score big on longer routes with lots of precise foot work, they invite attention to your toe push and because of there turn down will excel on overhanging rock. There's nothing to default as even if you like the softness and suppleness of a slipper these will work in that department too. Hopefully they will make me climb as smooth and flowing as the above picture of the river near the cliffs. It was 30 degrees today, not so cool but the shoes were, even if I was not. 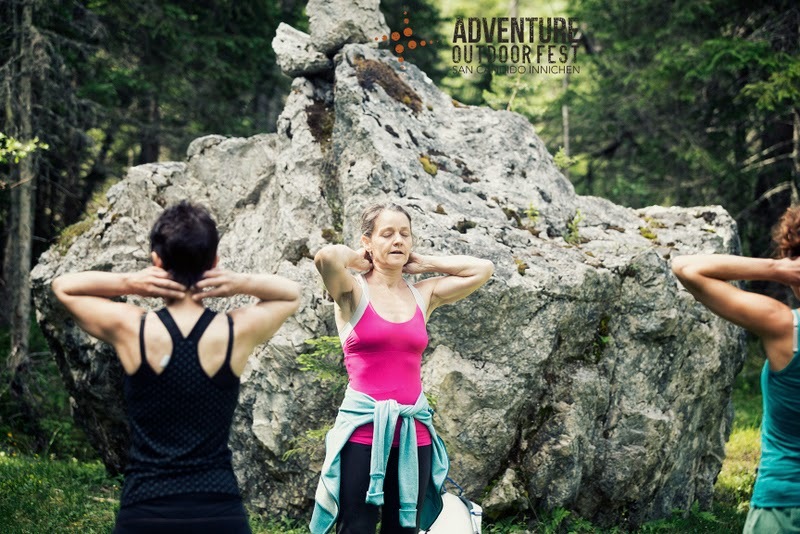 Climbing workshop at San Candido Festival. by Stevie Haston. Just a few photos from Laurence Gouault and my workshop a few days ago. Just like to say thanks to every body; Giovanni Danieli for the great photos, Carlo Cosi the guido. This was a pre climb yoga session in a flower decked meadow before a short uphill walk to a very beautiful cliff. Laurence and her three girls, Anna, Daniela, Giulia all did great and wanted more. I skipped the yoga session, ran up to the cliff and put topes on six routes. These routes were all great and where chosen for their technical aspects. This wasn't hard as these crags are often like that, highlighting your weak points. 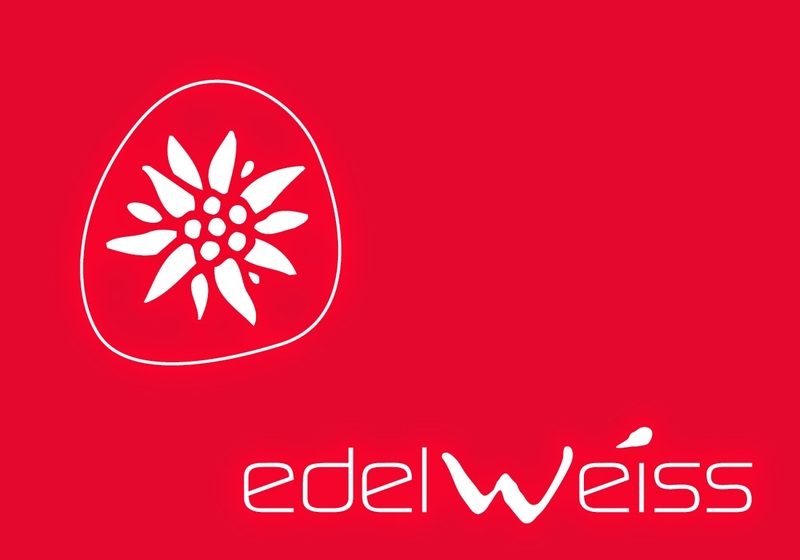 Anyway we had a lot of fun and will go back to San Candido next year for more of the same. I was very pleased to have our work well received but this was as much due to the open minds of our pupils who will definitely go much further with their climbing. Although I was working, I really enjoyed myself and felt rewarded because the girls showed not only the benefit of the class but communicated their enjoyment and love of climbing itself. This approach to climbing through yoga and breath and mind control seems to be working well. Anyway all very positive stuff and the Yoga classes in the town were also well attended, it was great to see this approach given its due and very gratifying to see one of the best climbers in Italy really taking some stuff onboard. 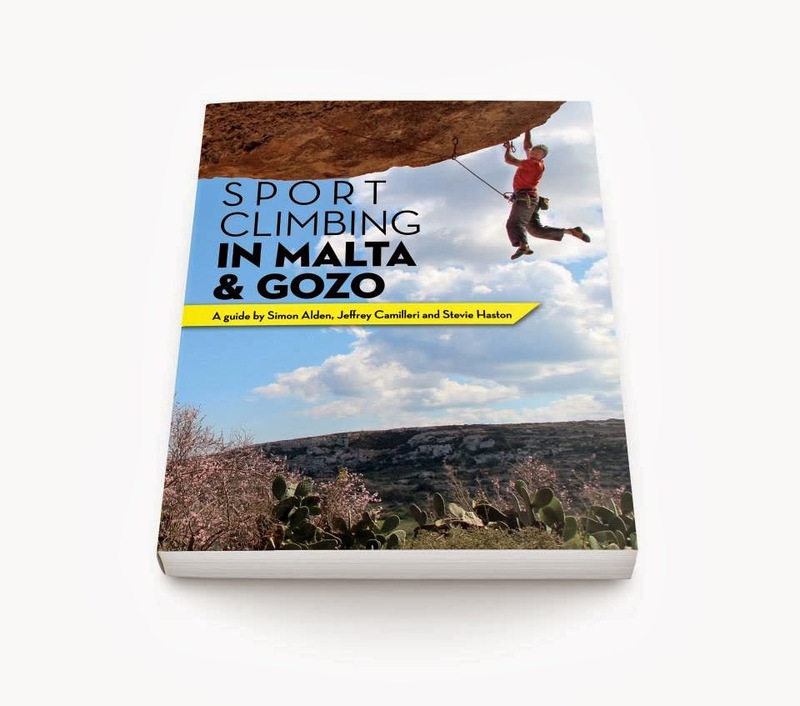 If you are interested in something similar, Yoga and climbing please contact us. We are open to teach anywhere but particularly in Malta, or France. Today was glorious and so we went climbing! Stunning, spectacular, words are rubbish, rock rules in the Dolomites. Laurence giving her well received yoga class, which was mainly about breathing, and the mind in climbing, three 9a climbers were in attendance! Some Parlour dudes making a good show. There was lots of fun going on at the Candido Adventure Outdoor Fest. You just can't escape from magic views in Candido. 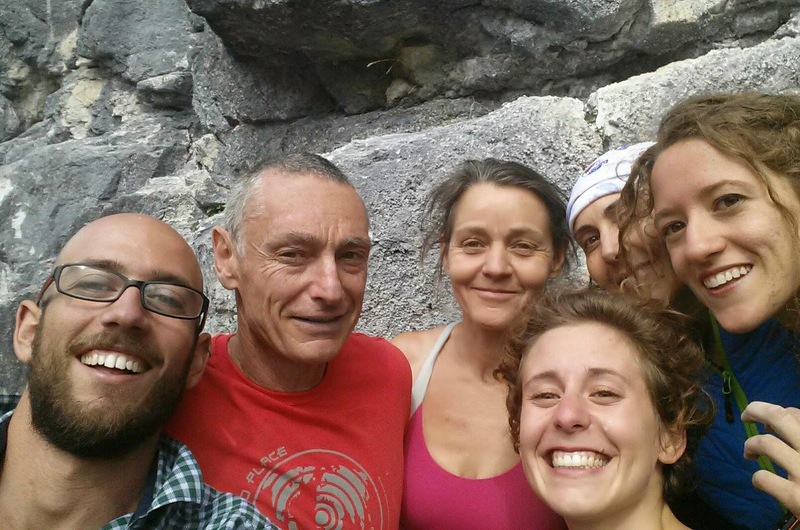 There was a discusion yesterday, some of Italia finest young sport climbers, Laurence the Yogie, Steph Davies the flying squirrel, a man who discovered 20kg of gold (he paid for the beers) and it was all strangely good for a change. In a bit of a slack line moment more. So, here we are in San Candido in the Italian Dolomites, its really great! It's sunny, the scenery is stunning, the people are all great and its just plain good. There's running, climbing, biking, walking, yoga, photography, slack line, and more. Nicole and Fabio the organisers, two warm people in the second year of this mountain festival they have put together diverse sports and activities with some product stands and a really high slack line over the square from a church tower to a hotel, people are enjoying it all. It's hard not too in this great little mountain town. There's a huge amount of yoga here, it's importance here too sports and life in general seems to be not stressed but lets say outlined by its very strong presence. There are seven different kinds of yoga to choose from. So much yoga to choose from but really if your like me you won't choose you will just try or look. 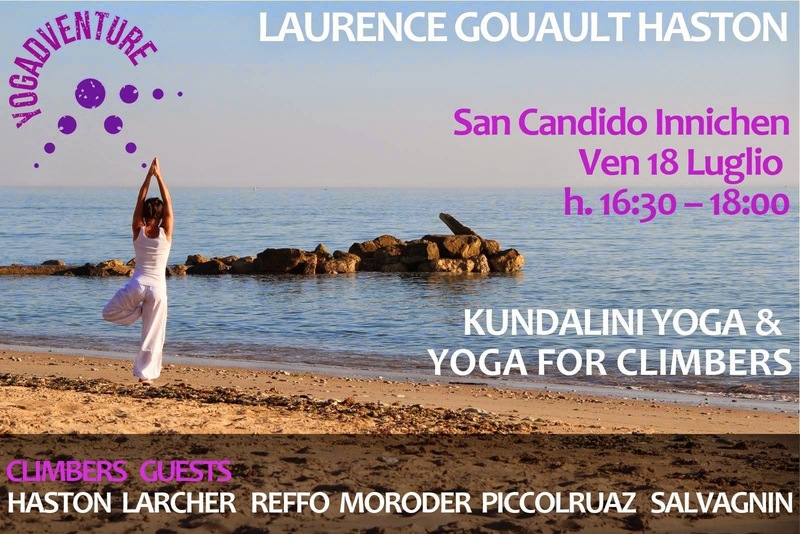 Laurence Gouault Haston is presenting Kundalini yoga which emphasises breathing and mind, I am doing a workshop for helping climbers with climbers of different standards, who have also hopefully done some yoga with the other yoga teachers, but I'll be doing some yoga stretching with them as a supplement. The super talented Loic Collomb Patton kindly posing with me! Loic is World FreeRide Champ 2014. He rides long skis for his size, coz he's fast, and for the more acrobatic stuff he goes down to 183, toad ski users take not! These babys are promised to me. Typical street scene, it's just so sweet, and down the road you have a view of the Tre Cime, or Trei Zinnen in tedesco. 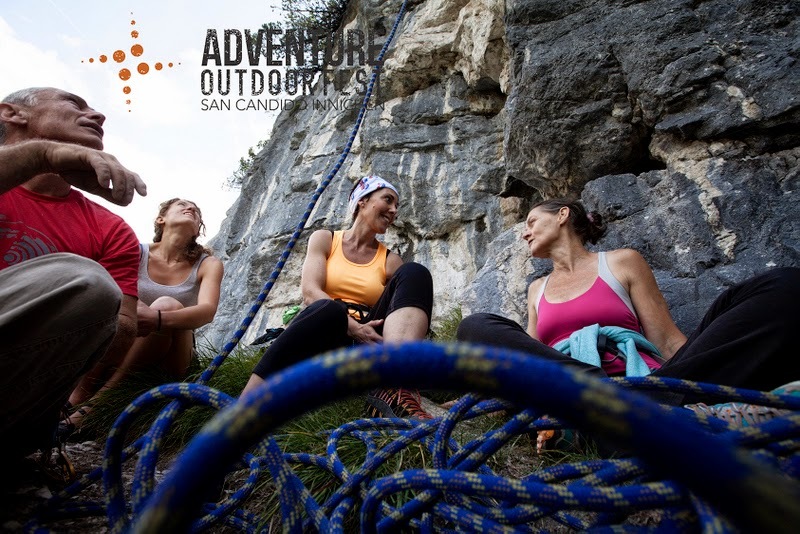 Laurence and I are doing a combined climbing work shop for improving your climbing at the San Candido Adventure Outdoor Festival. 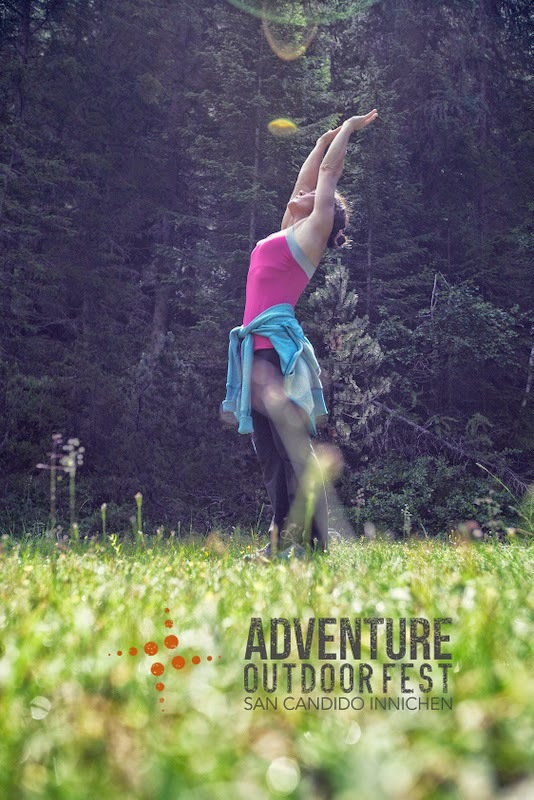 Laurence does a Yoga class for climbers on the 18th, which is mainly focused on warming up, focusing the mind by breathing exercises, and relaxation. 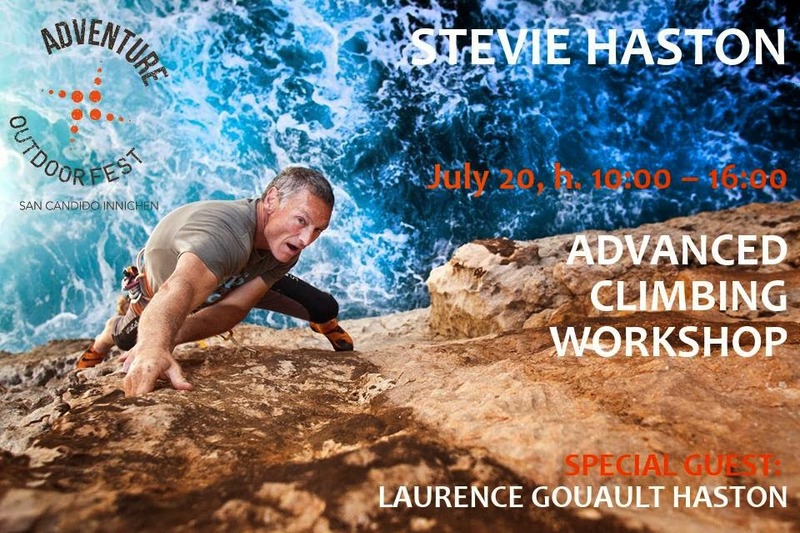 On the 20th, I will be asseing climbers, and giving advice with Laurence's help, this is as an adjunct to her class, and hopefully we will be able to communicate many of techniques which have helped us improve at our climbing. Many people know I am a good climber but, it is only by serious reflection on many of my weaknesses that I have reached most of my potential. Here is a link to the Program of the Festival, come and join Laurence and I and have more fun and success! My new look, by Stevie Haston. Just watched a very life affirming film called Fatso, check it out! The guys an Italian New York Fat sweetie, he had me grabbing my slightly chubby sides with chuckling fits. So obviously it's dieting time again for me, did my finger board routine and basically failed and felt like an oil tanker sinking in the Bay of Biscay in a November gail. Felt so unhappy eat a whole tray of vegetarian Lasagna, boy it was good! Anyway, went back on the finger board took off 10 kg by a pulley and weight, and hey presto , magic results despite greesy sloppy fingers. I have booked my Collonic irrigation, liposuction and jaw wiring, success is imminent, stay tuned. If body lice were this big, they would take them way more seriously. This is Tonto, one of my all time comic book heroes, he's having a slightly bad day, scorpion on the face kinnda day. This is the Lone Ranger, who is clearly never that alone as he has Tonto by his side, and scorpions. Nothing is ever as it seems, especially in climbing. Climbing media sinks further into the abyss and makes comics look very attractive. Long live rock, rock and roll, small portions of veg Lasagna, and one alcoholic beverage!